Serengeti National Park is indeed the best-known wildlife sanctuary in the planet, known for its natural beauty and scientific value. It is a Tanzanian national park in the Serengeti ecosystem in the Mara and Simiyu regions. The name ‘Serengeti’ comes from the Maasai language and appropriately means an ‘extended place’. 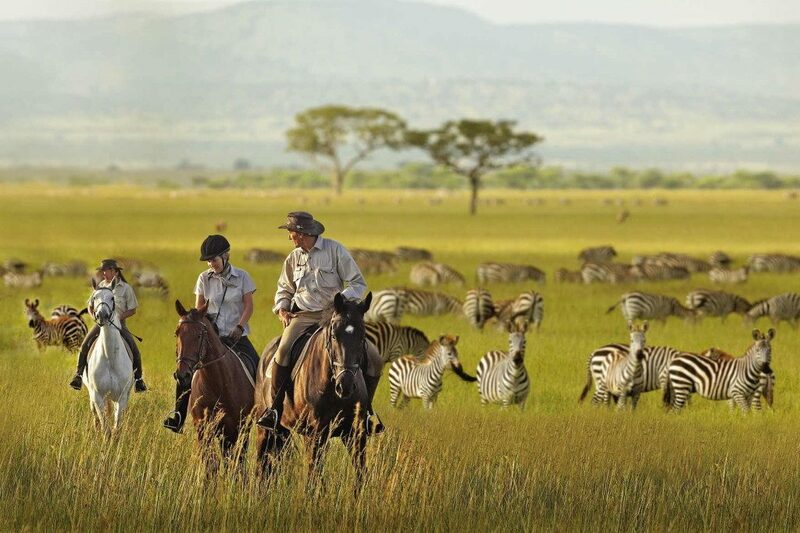 Serengeti was founded in 1913 by an American called Stewart Edward White. Serengeti has more than two million wildebeest, half a million Thomson’s gazelle, and a quarter of a million zebra, it has the greatest concentration of plains game in Africa. . Its landscape, originally formed by volcanic activity, has been sculptured by the concerted action of wind, rain and sun. It now varies from open grass plains in the south, savannah with scattered acacia trees in the center with wooded grassland in the north, to the black clay plains to the west. Small rivers, lakes and swamps are distributed all over. In the south-east rise the great volcanic chains and craters of the Ngorongoro Highlands. 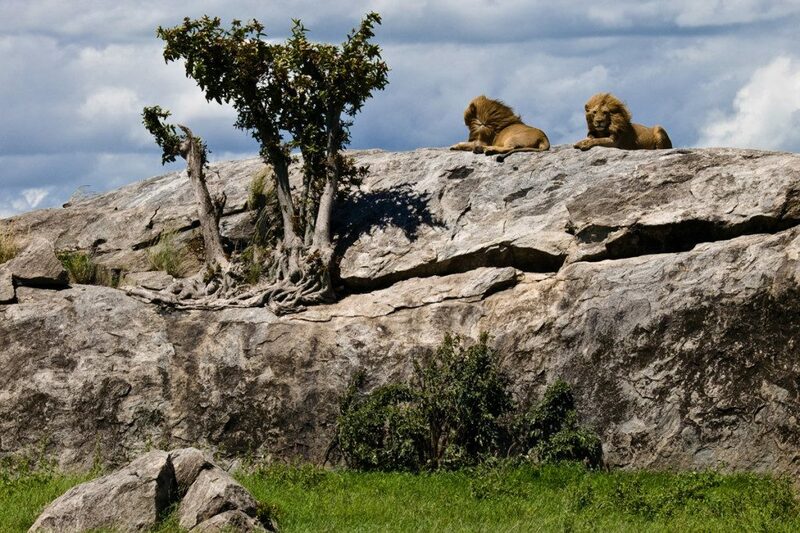 The Serengeti is the most famous park of Africa. The Serengeti Park is featured in many documentaries and the photographers and video takers have stunningly captured the wildlife beauty of the place .The Serengeti is a UNESCO World Heritage site. It is home to the huge wildebeest migration and offers top class wildlife viewing and experience throughout the whole year. The climate in Serengeti is usually warm and dry. It is rainy from March to May. The Park offers some of the best wildlife viewing in Africa. Serengeti is renowned for its grassland plains in the southeast. The northern part is more hilly and rocky. To the west, valleys, rivers and forest can be found. The scenery is stunning and feels like untamed wilderness. It is amusing to watch the wildebeest (Connochaetes taurinus mearnsi) and zebra form the star cast of an enormous annual Serengeti migration. 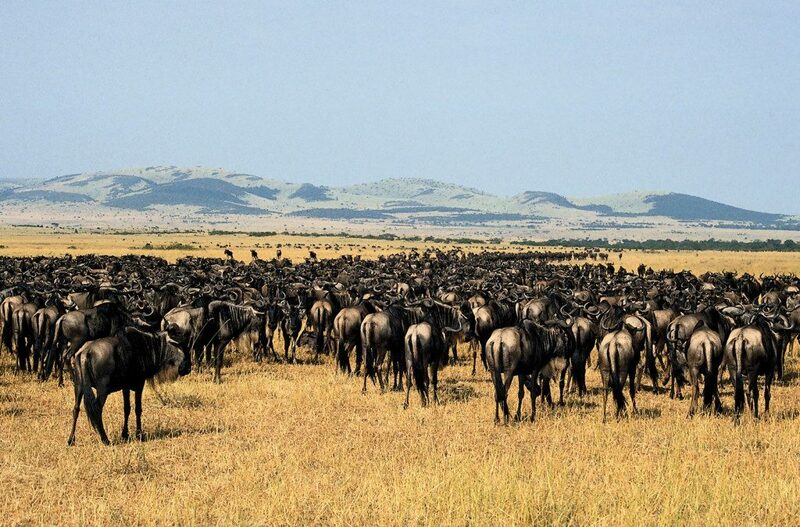 Every year, over 2.5 million wildebeest and zebra migrate from the Serengeti to the Maasai Mara Reserve in Kenya. If you’re there at the right time, you can spot herds of wildebeest and zebra stretching to the horizon. Other than wildebeest and zebras Serengeti has various large mammals. Lizards like Gaudy agama and rock hyraxes scuffle around the surfaces of the park’s isolated granite. Also a full 100 variety of dung beetle have been recorded, including 500-plus bird species, ranging from the outsized ostrich and peculiar secretary bird of the open grassland, to the black eagles that ascend naturally above the Lobo Hills. Serengeti Plains, stretching across sunburnt savannah to a glittering golden horizon at the end of the earth. However, after the rains, this golden expanse of grass is transformed into an endless green carpet marked with wildflowers. 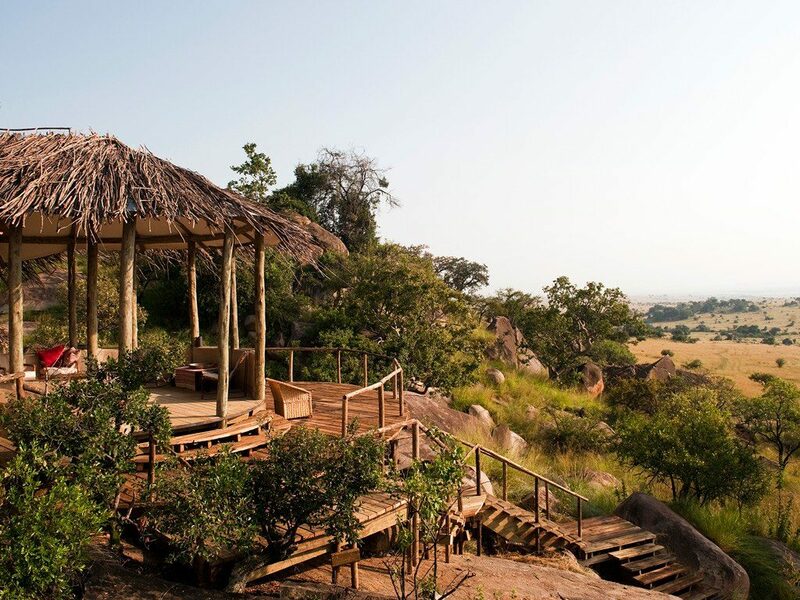 And there are also wooded hills and towering termite mounds, rivers lined with fig trees. For Visitors and tourists safari cars are available for rent .Elephant safari is also one of the common choices for the people. Visitors can experience the beauty and wildlife by Hot Air Balloon ride from the top view which covers a wide angle to view the landscape and the animals. You can also have a picnic on the Ngoro Ngoro floor with your family and friends. Also visit Olduvai Gorge, where remarkable archaeological discoveries have been made and also said to be the “birthplace of mankind”. Serengeti might be known by its name, but it remains so vast that visitors are the only human audience when a pride of lions conceives a siege, focused solidly on its next meal. 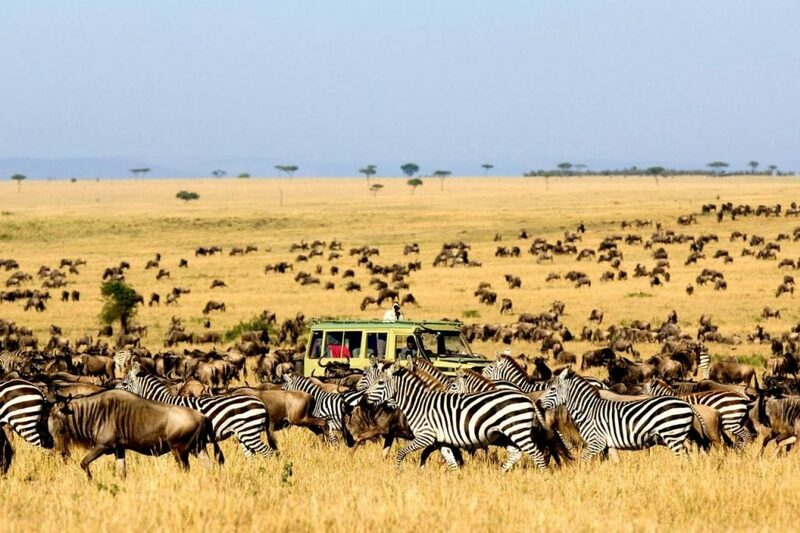 Millions of wildebeest and zebra each one driven by the same antique rhythm fulfilling its inborn role in the inescapable cycle of life against the predators. A furious three-week bout of territorial conquests and mating, wildlife survival of the fittest as herds plunge through crocodile-infested waters on the annual migration north; replacing the species in a short-lived population explosion that produces more than 8,000 calves daily before the 1,000 km journey begins. The diverse habitat enables it to support more than 30 species of large herbivores and nearly 500 species of birds each area has its own particular atmosphere and wildlife. Five of the families of cat can be found. Only the rhinos and wild dogs are the endangered species because of the poaching.